Famous for its thrilling ultra-modern cities, Japan is also home to some of the world’s most stunning areas of natural beauty, where cherry blossoms and hydrangea bloom in spring and maple trees blaze fiery red hues across the land in autumn. Having selected these two splendid seasons as the most magical times to visit, our fully-escorted Japanese tour highlights the vitality of Tokyo and Hiroshima, the tranquillity and charm of temples, shrines, museums and gardens and the march of technology with an included journey on the lightning-fast Shinkansen (Bullet Train), all enhanced with the most gracious hospitality of the Japanese. For more information please call a member of our team on 020 8882 0141. Titan’s VIP Home Departure Service® collects you from home, for your journey to London Heathrow Airport and a direct, scheduled British Airways flight to Tokyo. On arrival, we transfer by coach to the Hilton Tokyo (4T) or Keio Plaza Hotel (4T), located in Shinjuku, in the very heart of the Tokyo metropolis, for a two-night stay. We embrace this dazzling city with a full day tour, taking in legendary landmarks - the moated Imperial Palace, the Ginza (Silver Mint) district, the five-storey Asakusa Kannon Temple and the 333m Tokyo Tower. 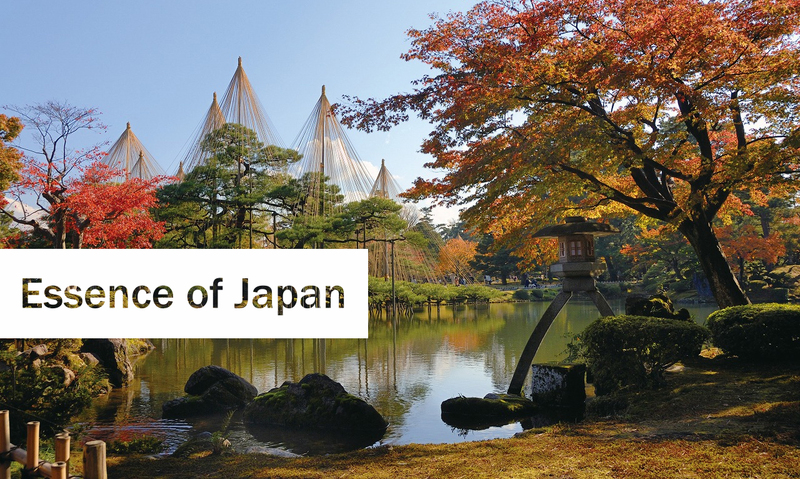 One of the star attractions is Meiji Shrine, the picturesque Shinto shrine set in a delightful tree-lined avenue. The Five Lakes District is dominated by majestic Mt Fuji, an icon of world travel towering over this region of exceptional natural beauty - on a clear day, the snow-capped, conical volcano is mirrored on the placid waters of Lake Kawaguchi. 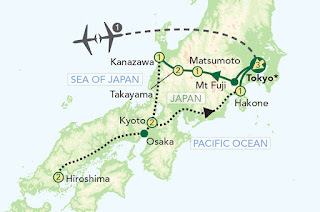 From here we continue to Matsumoto and our accommodation, the Buena Vista Hotel (3T+) or Matsumoto Tokyu REI Hotel (3T+). This morning we visit Matsumoto Castle, a striking timber and stone structure with a unique moon-viewing turret. We also take time to sample sake at a traditional brewery. 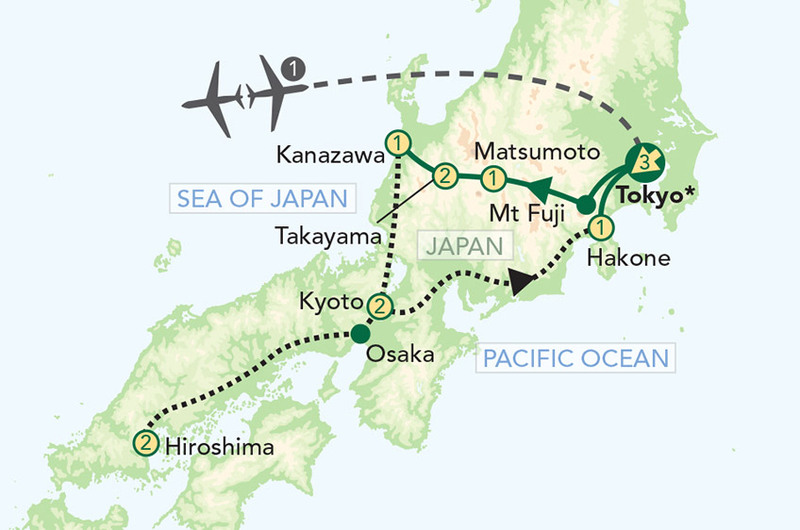 Our journey proceeds through the breathtaking Japanese Alps to the hill town of Takayama. Here we stop at the Hida Folk Village, a large open-air museum with a collection of antique houses from the region and a fabulous showcase of crafts and ancient traditions. We spend the next two nights at the Best Western Hotel Takayama (3T) or Takayama Associa (3T). We transfer by coach to Kanazawa visiting the World Heritage Shirakawago Village en route. Kanazawa is an historic castle town, which boasts beautifully preserved samurai and geisha districts and our sightseeing tour includes Omicho market and Higashi Chayagai before heading to the Kanazawa Tokyu Hotel (4T), where we spend the night. We pack overnight bags whilst our main luggage is transferred to Kyoto for our arrival on day 10. A sightseeing tour of Kanazawa this morning includes the gorgeous Kenroku-en Garden and Buke-Yashiki (Samurai's house). We then transfer to Kanazawa Station to depart for Hiroshima via Shin Osaka by JR Limited Express Train and JR Bullet Train. On arrival, we head to the Rihga Royal Hotel Hiroshima (4T) or Hotel Granvia Hiroshima (4T) to spend the next two nights. We transfer to Hiroshima Station for our JR Bullet Train journey to Shin Osaka, where we board our coach for Nara, the first permanent capital of Japan. Attractions here include the famous Todaiji temple, which was built in 794 and became the guardian temple for the city. The building is claimed to be the oldest wooden structure in the world and houses a huge bronze Buddha. We also visit Nara Park, also known as Deer Park, to see hundreds of freely roaming deer. Our adventure proceeds to culturally-rich Kyoto, known historically as ‘Hana No Miyako’, the flowering capital with its wealth of fine architecture in its shrines and temples, gardens with their profusion of colour and variety of art and craft shops. We spend time in the Gion area, the country’s most famous geisha district, before heading to the Kyoto Hotel Okura (4T), Kyoto Tokyu Hotel (4T) or Nikko Princess Kyoto (4T), to enjoy a two night stay. Highlights of this morning’s tour include the wonderful Ryoanji Temple, a Zen temple with a famous rock garden, and also the beautiful Kinkakuji Temple, or the ‘Golden Pavilion’, whose top two floors are completely bedecked in gold leaf. We also enjoy a traditional tea ceremony. After further exploration of Kyoto, with stops at the Kiyomizu Temple and Nijo, a fortified castle with ornate audience halls and unique ‘nightingale’ floors designed to replicate the sound of the nightingale song when stepped on. We later take the JR Bullet Train from Kyoto to Mishima and continue to Hakone, for a one-night stay at the Palace Hotel Hakone (3T+). This morning we embark on a cruise on Lake Ashi, from where stunning views of the snow-capped mountains can be seen. We continue by cable car over the Owakudani Hot Springs, lying in the crater of Mt Kamiyama. We later enjoy marvellous views of Tokyo Bay before continuing to the ANA Crowne Plaza (3T). Today we leave Tokyo for Narita Airport and a direct, scheduled British Airways flight to London Heathrow Airport. On arrival you will be met and guided to your Titan vehicle, for the journey home.